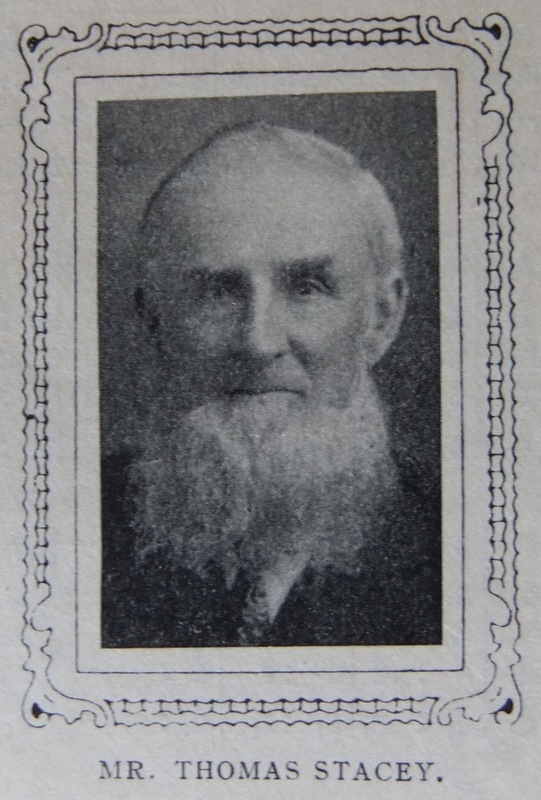 MR. THOMAS STACEY, the Society steward for the past twenty years at Fishlake, in the Doncaster Second Circuit, would be the last man in the world to court publicity, but is nevertheless of that type which is worthy of public recognition, and is invaluable to Primitive Methodism. Of a quiet disposition and unobtrusive order he renders unstinted service to our church in his village. As Society steward he attends assiduously to all the duties incident to that office, and as Chapel and Pew steward for a period of twenty years he carefully watches all the interests connected with those departments. For sixteen years he has also been a Class leader, school teacher for thirty-nine years, and school superintendent for ten years. In addition he has held the office of local preacher for thirty-seven years, and renders acceptable service in the pulpits of the Circuit on the occasions when he permits himself to be drawn away from the village interests. His membership with Fishlake Primitive Methodism goes back forty-one years, and he is both a trustee and the caretaker of the village chapel. He was converted as young man of twenty-nine in the old chapel hard by the present building, and for forty-one years has had an honoured place in the church, and rendered efficient service in its many departments. He is now seventy years of age, and yet gives every evidence of being able to serve Christ and Fishlake Primitive Methodism for many years to come. To-day he is respected and recognized as a senior and leader amongst his brethren; and his long record of faithful service has given him an abiding place in their affections. Thomas was baptised on 8 August 1841 at Barnby Dunn, Yorkshire. His parents were Thomas, who worked the land, and Bessy. Thomas married Mary Duckitt (1843-1918) on 10 January 1867 at Fishlake, Yorkshire. Census returns identify six children. Thomas died in March 1926 at Fishlake, Yorkshire.